A mouse is a mouse, right? If you’re a PC gamer, that statement is very wrong. You see, sure a regular mouse is usable if you’re playing games like Candy Crush Saga or Plants vs Zombies, but once you start playing games of a higher caliber in terms of competitiveness and difficulty, you’ll soon find that your cheap, OEM mouse is about as useful as not having a mouse at all. Like with the Logitech G19s gaming keyboard I looked at here, you’ll want something just as programmable and feature packed as that. Luckily for you, Logitech has a full line of PC gaming accessories and that also includes their new G700s rechargeable wireless gaming mouse. This is their top of the line gaming mouse which includes features such as ergonomic shape and design, gaming grade laser for precision, onboard memory profiles, 13 programmable controls, and the ability to use it in both wired and wireless modes. The first thing you’ll notice about the G700s is that the mouse itself is a tad bit larger than most. In fact, I think this may be the largest mouse I’ve ever used. However, the larger size seems to be way more comfortable than anything I’ve used. It fits perfectly in my palms and contours to the curvature of my hand. The second thing you’ll most likely notice about it are the generous amount of buttons scattered about. All are easily reached by your fingers or thumb and each can be programmed to perform some function. The G700s is also quite a bit heavier than most mice you may be used to. This of course allows for a more accurate and precise feel in my opinion as well keeping the mouse nice and grounded. Like most gaming mice, the G700s uses different materials than what you find on a cheap OEM mouse. 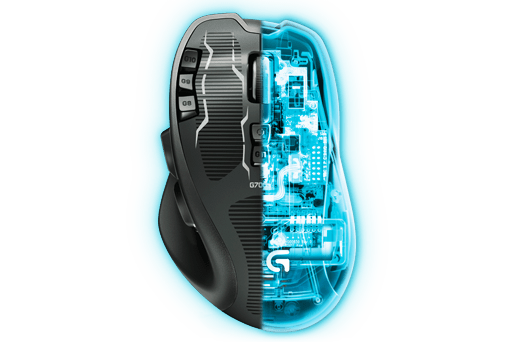 For starters, yes the mouse is made of plastic but in areas like the palm rest, the G700s includes hydrophobic coating to prevent your hands from sticking in situations that have your palms sweating. In the finger tip areas, the G700s also includes a fingerprint-resistant coating to the primary buttons to keep them looking great no matter the situation. 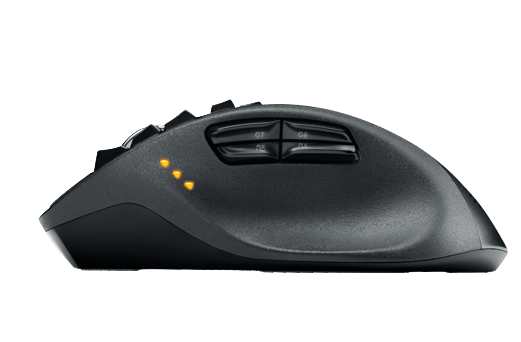 For the sides of the mouse, Logitech included dry grip on the sides, again to keep your hands steady and precise. 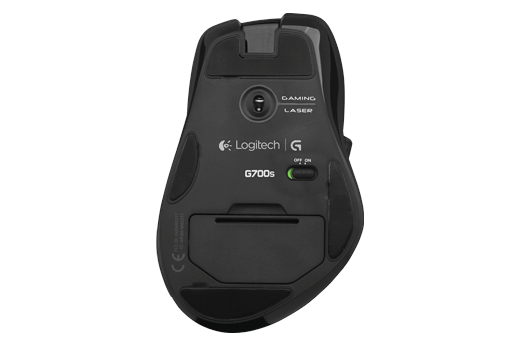 These are usually features you look for in a gaming mouse and Logitech included them all with the G700s. They even included little details like low-friction polytetrafluoroethylene feet that reduce drag for faster motions, smoother cursor movements, and improved accuracy. Of course most people will probably buy the G700s because of the programmable buttons and being able to use it wirelessly. There are nine extra buttons on the mouse that you would not normally find on a regular one. That’s not even including the scroll wheel which can scroll left and right, not just up and down. There are five buttons up top that can be reached with your index finger and four buttons on the side that can reached with your thumb. They are all programmable except that there is one button up top that serves a really interesting function. Usually, with gaming mice, the scroll wheel when scrolling has a clicky feel. They do this because it provides much more precision when switching between menu options in a game. This is great for games but not optimal for things like internet browsing. 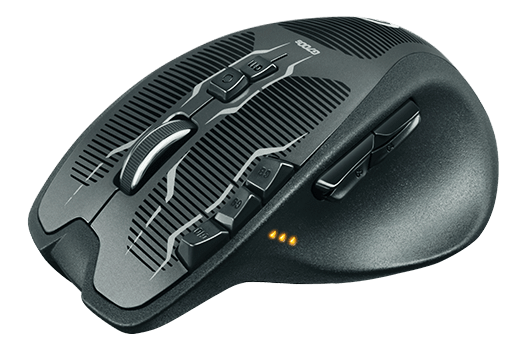 Because of this, the G700s provides a dual-mode scroll wheel. If you press the button located just under the scroll wheel, it will unlock the scroll wheel allowing it to move freely. This allows you to zip through web pages quickly. It’s a very neat feature and one that I have not seen before on other mice. Near where your thumb rests are three tiny LED lights that are used to display how much charge is left in the G700s if you are using it wirelessly. 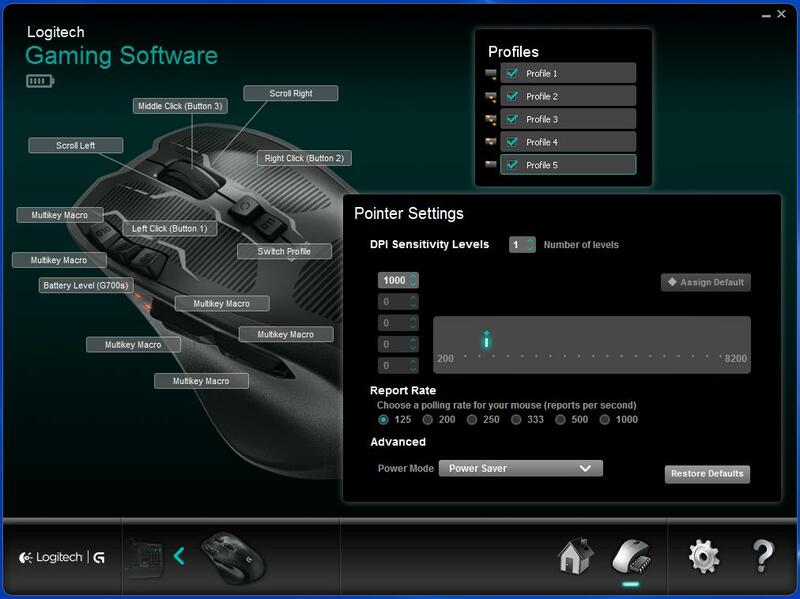 It can also be used to show what DPI sensitivity your mouse is set to at the time. This gives you a quick visual update. Last, since the G700s is wireless, it requires a wireless dongle in order to function wirelessly. The dongle connects to your computer via USB and you can basically just keep it plugged in at all times. The G700s is automatically synced to it. If you want to transport your mouse, just unplug the USB dongle and you can safely transport it in the G700s mouse by opening up a little door underneath the mouse and placing it in there. If you don’t want to use the G700s wirelessly, you can use the included USB cable and plug one end into your mouse and one end into your computer. This of course also recharges your G700s if you are using it wirelessly. Overall, I love the way the G700s feels and all the little features it includes. It is a very comfortable mouse with an excellent weight to it. It is a larger mouse, but even in my medium sized hands, it feels great and doesn’t feel overly large. That means those with lager hands should still be comfortable using it. I have no complaints about the hardware at all. 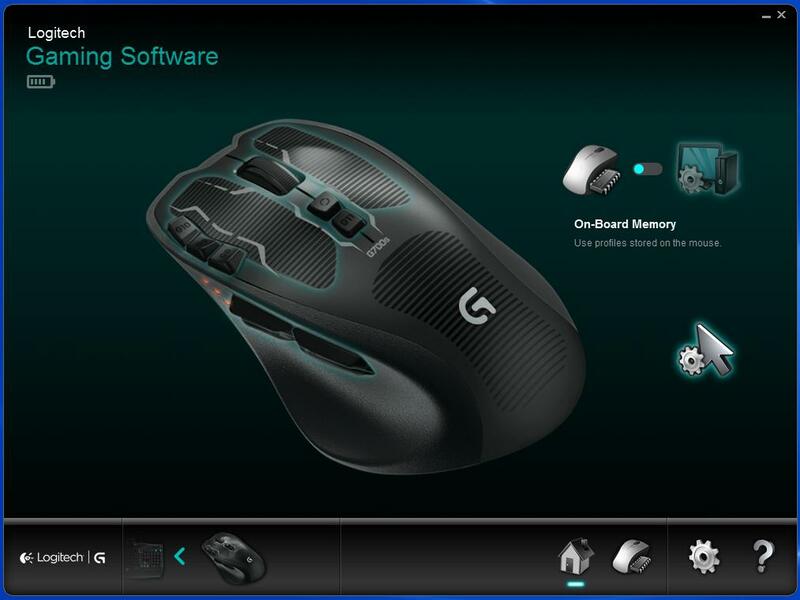 Like with the G19s keyboard I looked at earlier, the G700s also makes use of the Logitech Gaming Software. That means that if you already have the software installed because you’re using a Logitech G keyboard, then the mouse will automatically work with it. No need to install anything else. If you don’t have another Logitech product, than you can head on over to their site here and download the software for installation. Installation is necessary if you want to program the mouse and make custom profiles. The customizing aspect of the G700s is not that much different from the G19s keyboard. There is a tab that you use to assign functions to all the buttons. There are also profiles you can choose from and the software will auto detect which games you have installed and have profiles already set up for those games. Of course you don’t have to use those and you can make your own. Also, the software allows you to transfer profiles over to the G700s’s onboard memory so they are available to you if you are using the mouse on different computers. 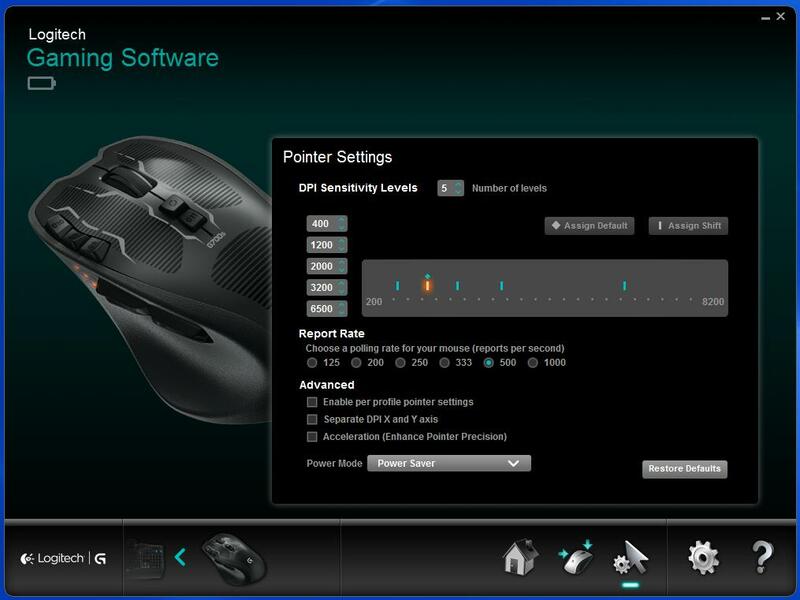 Lastly, there is another tab that allows you to adjust the sensitivity of the pointer anywhere from 200dpi to 8200 dpi. You can set points inbetween those two so that you can easily switch to different DPI sensitivites with a touch of a button. You can even separate the DPI settings for bot the X and Y axis if you want to. Again, the Logitech Gaming Software makes customizing quite easy with an easy to use interface that doesn’t make customizing a complicated mess. Those who have never customized buttons before will be able to jump right in with this. Logitech really has some great products in their G-series line of gaming accessories. The G700s is the second of these products I’ve looked at from Logitech and again, it’s another winner in my book. The G700s is comfortable, precise, and the fact that it is wireless means I don’t have to worry about getting tangled up in wires or limited by distance. I love the weight of the G700s as it feels sturdy and precise and this also goes for the scroll wheel which is also very nicely weighted with the unique dual-mode function. Not only does the G700s have a lot of features, it also looks good and matches up perfectly with the G19s gaming keyboard. I like that it has mainly matte surfaces and great side grip. The patterns on the face aren’t bad looking either. The only thing I would have liked to see would have been some custom lighting like on the G19s keyboard. This would have made it looks even better especially if the lighting was also tied to the keyboard as they would have matched up so nicely. Other than that, it’s still a very good looking and functional gaming mouse. 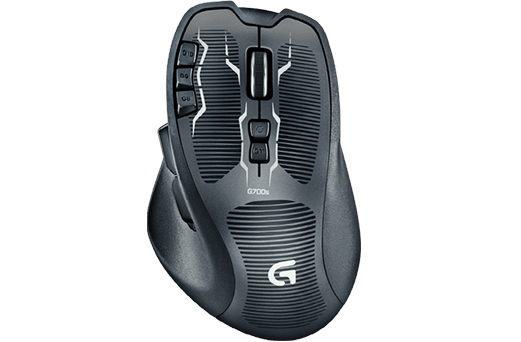 The G700s also isn’t too expensive either coming in at just under $100. Considering that it is a wireless mouse with all that programmability, that’s not a bad price at all. This review is made possible with my affiliation with G Style Magazine. It is also featured at the G Style Magazine website which is a tech blog that focuses on the fashion aspect of tech. Please visit their site for the complete review and more images. I think the G700s in one of the best wireless gaming mice. It doesn’t lag at all.